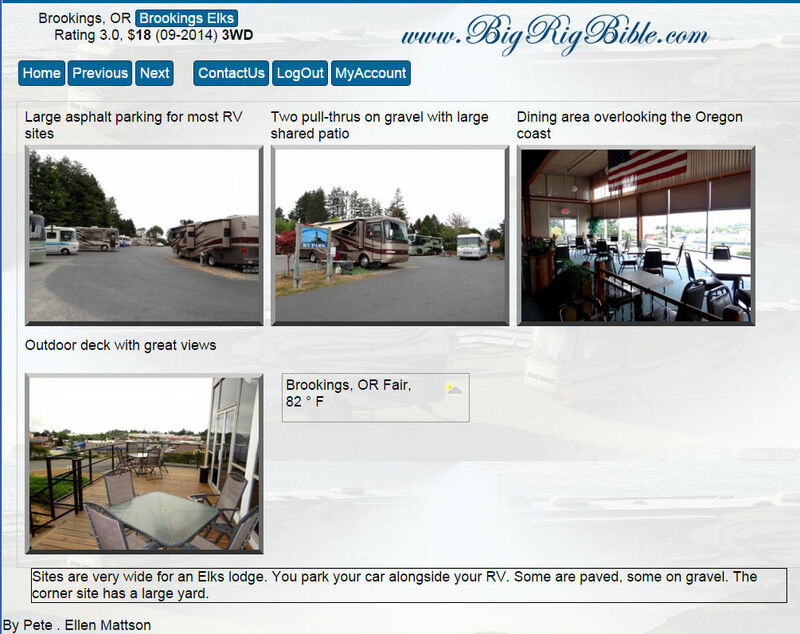 On our recent swing through Northern California and Southern Oregon, we visited seven RV parks that were not on BigRigBible. We have added these parks to the web site, which now has 380 RV parks, campgrounds and Elks lodges across North America. We began BigRigBible in November of 2008. Since that time we have posted photos from every park and list hookups, extras, ratings and current weather. After seeing our photos of a park, you can then use our link to the park's web site. Our photos will look like theirs for the nicer parks. But for others, you may wonder when and where their photos were taken! Our goal is to provide realistic photos of what you can expect. We also rate the parks, from 1 to 5, see Ratings. Our ratings generally reflect on how much we enjoy spending time at the RV site. We enjoy pools and spas and this may influence our rating. But normally we don't not change the rating based on facilities as you may not care about the same things we do. From the park's web site you can also see what facilities or activities they have. We don't consider the surrounding area unless this park might be walking or a short distance to some attraction versus driving distance from another park. To see our newest parks and all others we have visited, link to RV Parks we have Visited. Please comment and let us know what you think of our park pages.